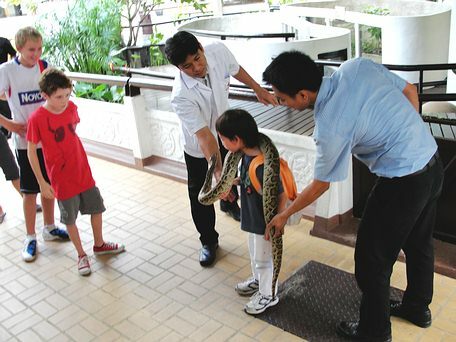 Brave boys with a Burmese Python at Queen Saovabha Memorial Center, Bangkok, Thailand. Yesterday I went to the Queen Saovabha Memorial Institute created by the Thai Red Cross Society in Bangkok, Thailand. Doesn’t sound like it has anything to do with snakes – does it? It’s all about snakes in Thailand actually. This institute is located on the or next to the Chulalongkorn Memorial Hospital – a very prestigious hospital in Thailand. The cost was 200 Thai baht to get in and see the snakes. There is an outdoor display area where there were a couple of non-native snake species like a python from South America. The king cobra exhibit was under renovations. There were some green anacondas, also native to South America. I’ll use some of the photos of the Javan File Snake and striped keelbacks on the appropriate snake pages inside the site here. In total, outside were about 12 types of snakes. Inside the snake institute were snakes in glass tubes that were dead and illuminated with light. The colors of the snakes were all washed away due to the chemicals used to preserve them. That wasn’t so helpful. The red-necked keelback, a very common Thailand snake, was in one of these bottles and was white. These are one of the most colorful snakes Thailand has in the country. It was sad to see them as white and void of color. Misleading quite a bit too if you don’t know all the white snakes have a lot of color. On the second floor of the institute building were some educational displays designed to teach people the basics about Thailand snakes. The best part of the visit to the “snake farm” as it’s called on signs there, was the snake handling for a small crowd of about thirty of us. There were many children in the audience and they had a good time touching the snakes and holding a Burmese Python that was tame – captive bred, and didn’t bite at all. The snake handlers showed us banded yellow kraits, a spunky king cobra, the Burmese Python, a green white-lipped pit viper, and a monocled cobra – a large specimen. 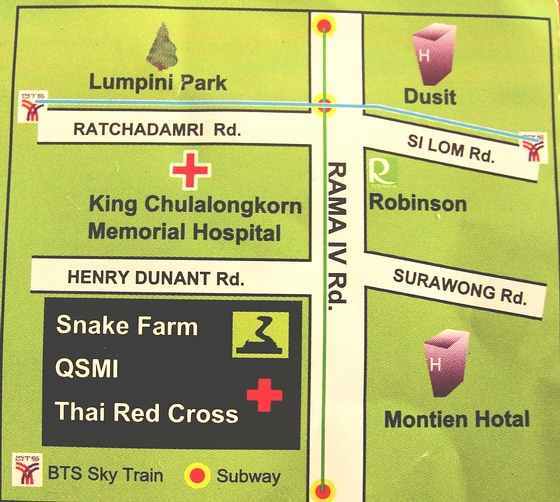 I recommend you visit this snake farm if you have a chance in Bangkok. It is not really as nice as I expected, and there is a limited number of live snakes in the displays – maybe 30 types? They say there are more than 200 species of snake in Thailand and over 60 of them are venomous. Why do they only show about 30 of them? I guess I wanted this place to exceed my expectations and have all the snakes of Thailand represented. Sounds like something someone should do at some point. Thailand has a lot of amazing snake species which you can find out a lot about by visiting this center, and other snake places across the country. And, don’t forget this site, of course. Click Snake Farm map to enlarge.